WWII British Weapons: 2 inch mortar - article, photos, and information. 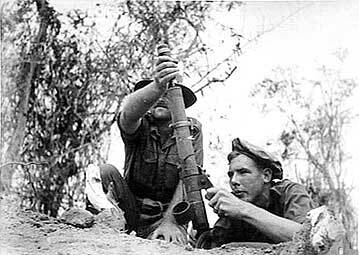 The 2 inch mortar was used by British and Commonwealth countries during World War II and was smaller than the mortar used during World War I bearing the same name. Light and portable, some versions weighed only 10.25 pounds. The standard version of the 2" mortar fired a high explosive bomb 2.25 pound bomb from its 21 inch long barrel and could fire up to 8 rounds per minute with a maximum range of approximately 500 yards. The three inch and other mortars with longer barrels could be "dropped fired", but the 2 inch was too short for this method and a trigger mechanism was used instead. Operating the mortar was accomplished by a "loader", who dropped a bomb into the barrel, and a "firer" who lined up the white line on mortar barrel to the target and eventually pulled the trigger lever. Earlier mortars came with sights but these were eliminated when sighting by eye proved to be quite effective during combat. Earlier versions also had base plates but these were replaced with a curved or spade plate which helped to decrease the weight of the mortar. These mortars had a fairly strong recoil and so were not hand-held when fired but rather set on the ground or mounted for use. Various version of the British 2" mortar were designed during World War II for use in infantry platoons, airborne forces, on Universal Carriers, and as tank smoke-launchers. The main types of rounds used were high explosive, smoke, and illuminating. “Between 1940 and 1945 British factories ...turned out some 40,000 2-inch mortars”. John Norris, Infantry Mortars of World War II, (p10). Used throughout WWII, versions of the 2 inch mortar continued in use through the 1970s.